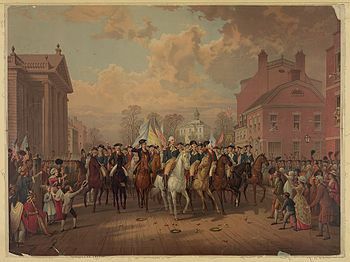 Following the American Revolutionary War, Evacuation Day on November 25 marks the day in 1783 when the last vestige of British authority in the United States — its troops in New York — departed from Manhattan. After this British evacuation, General George Washington triumphantly led the Continental Army through the city. The last shot of the war was reported to be fired on this day, as a British gunner on one of the departing ships fired a cannon at jeering crowds gathered on the shore of Staten Island, at the mouth of New York Harbor (the shot fell well short of the shore). Following the first and largest major engagement of the Continental Army and British troops in the American Revolutionary War, at the Battle of Long Island (also known as the Battle of Brooklyn) on August 27, 1776, General George Washington and the Continental Army retreated to Manhattan Island. The Continentals withdrew north and west and, following the Battle of Fort Washington on November 16, 1776, evacuated the island. For the remainder of the Revolutionary War much of what is now Greater New York and its surroundings were under British control. New York City (then occupying only the southern tip of Manhattan) became, under Lord Howe and his brother Sir William, the British political and military center of operations in North America. David Mathews was the Mayor of New York City during the British occupation. Correspondingly, the region became central to the development of a Patriot intelligence network, headed by Washington himself. The famous Nathan Hale was but one of Washington’s operatives working in New York, though the others were generally more successful. The city suffered a devastating fire of uncertain origin during the British occupation. This resulted in the British forces and prominent Loyalists occupying the remaining undamaged structures, relegating the fire-scarred ruins for the rest of the city’s residents to live in squalor. In addition, over 10,000 Patriot soldiers and sailors died through deliberate neglect on prison ships in New York waters (Wallabout Bay) during the British occupation — more Patriots died on these ships than died in every single battle of the war, combined. These men are memorialized, and many of their remains are interred, at the Prison Ship Martyrs’ Monument in Fort Greene Park, Brooklyn, overlooking the nearby site of their torment and deaths. 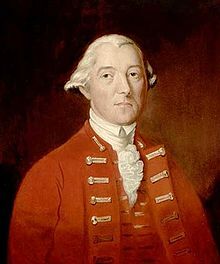 In mid-August 1783, Sir Guy Carleton received orders from London for the evacuation of New York City. He told the President of the Continental Congress that he was proceeding with the withdrawal of refugees, liberated slaves and military personnel as fast as possible, but it was not possible to give an exact date because the number of refugees entering the city had increased dramatically. More than 29,000 Loyalist refugees were evacuated from the city. 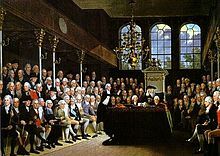 The British also evacuated former slaves they had liberated from the Americans and refused to return them to their US enslavers as the Treaty of Paris had required them to do. Carleton gave a final evacuation date of noon on November 25, 1783. Entry into the city by George Washington was delayed until after a British flag had been removed. A Union Flag was nailed on a flagpole in the Battery Park at the southern tip of Manhattan. The pole was allegedly greased. After a number of men attempted to tear down the British color – a symbol of tyranny for contemporary American Patriots – wooden cleats were cut and nailed to the pole and with the help of a ladder, a veteran, John Van Arsdale, was able to ascend the pole, remove the flag, and replace it with the Stars and Stripes before the British fleet had sailed out of sight. Seven years after the retreat from Manhattan, General George Washington and Governor George Clinton reclaimed Fort Washington and then led the Continental Army in a triumphal march down Broadway to the Battery. 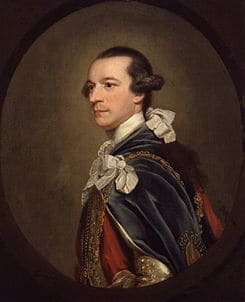 Sir Guy Carleton, the British-appointed governor Andrew Elliot, and some other former officials left the city on December 4. Even after Evacuation Day, British troops still remained in frontier forts in areas which had clearly been defined by the Treaty of Paris (1783) to be part of the United States. Britain would continue to hold a presence in the old Northwest until 1815, at the end of the War of 1812. On December 4, at Fraunces Tavern, General Washington formally said farewell to his officers. He later left the city and on December 23, resigned his commission as commander-in-chief. For over a century this event was commemorated annually with boys competing to tear down a Union Flag from a greased pole in Battery Park, as well as the anniversary in general being celebrated with much adult revelry and corresponding beverages. The importance of the commemoration was waning in 1844, with the approach of the Mexican-American War. The observance of the date was also diminished by the Thanksgiving Day Proclamation by Abraham Lincoln on October 3, 1863, that called on Americans “in every part of the United States, and also those who are at sea and those who are sojourning in foreign lands, to set apart and observe the last Thursday of November next as a day of thanksgiving.” That year, Thursday fell on November 26. In later years, Thanksgiving was celebrated on or near the 25th, making Evacuation Day redundant. In 1900 Christopher R. Forbes was denied the honor of raising the flag at the Battery on Independence Day and on Evacuation Day and it appears that neither he nor any Veterans’ organization associated with the Van Arsdale-Riker family or the Anderson Zouaves took part in the ceremony after this time. Following the warming of relations with Britain immediately preceding World War I, the observance all but disappeared. Though little celebrated in the previous century, Evacuation Day was commemorated on November 25, 2008, with searchlight displays in New Jersey and New York at key high points. The searchlights are modern commemorations of the bonfires that served as a beacon signal system at many of these same locations during the revolution. The seven New Jersey Revolutionary War sites: Beacon Hill in Summit, South Mountain Reservation in South Orange, Fort Nonsense in Morristown, Washington Rock in Green Brook, the Navesink Twin Lights, Princeton, and Ramapo Mountain State Forest near Oakland. Five New York locations contributed to the celebration: Bear Mountain State Park, Storm King State Park, Scenic Hudson’s Spy Rock (Snake Hill) in New Windsor, Washington’s Headquarters State Historic Site in Newburgh, Scenic Hudson’s Mount Beacon.